I’ve made ice cream a few times before with cream or condensed milk and it is always a tad tricky, remembering to whisk it every hour so the ice crystals don’t turn it into sorbet, but I’ve decided I need an ice cream maker! My latest attempt was to tackle one of Nigella’s recipes containing 8 egg yolks, cream, etc. so pretty much the real thing, but I completely ruined it because I would get busy with other things and forget about “the great hourly stir”. Too bad as it had such potential, but never one to stay down for long, I came up with another plan…and copied the ice cream shop at the strawberry picking farm we visited the other day. 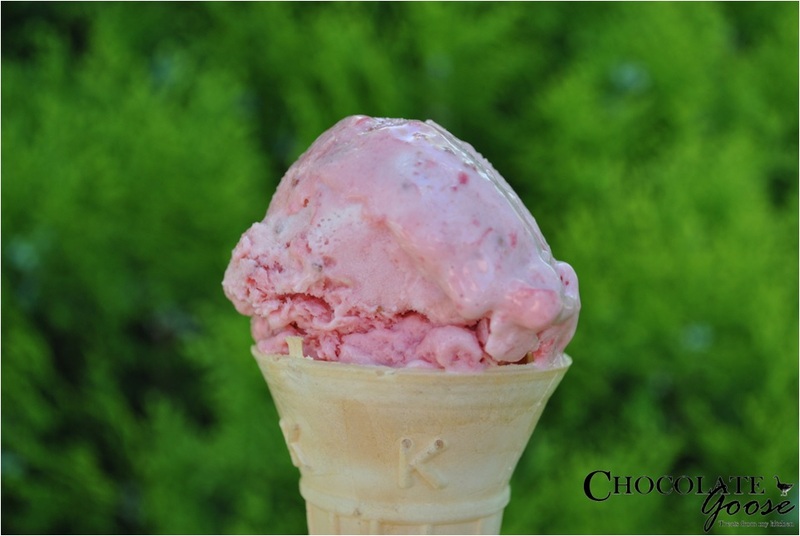 They simply blitz the ruby-red gems and mix them with good quality vanilla ice cream. Now I don’t mean the French vanilla type, or the really expensive boutique ones, or even the ice cream with vanilla seeds. Just use good old Tip Top vanilla (for my Kiwi friends) or a nice creamy plain equivalent. The ice cream has to be soft enough to mix evenly, but not melted. I left it out of the freezer for a few minutes and it was just right. Too long and you risk getting those blinkin’ ice crystals returning when you replace it in the freezer. Better yet if you mix and serve immediately. The crowds will adore you! Clean, rinse, hull and chop the strawberries. Add them to the softened vanilla ice cream and stir to combine. If too soft to serve, return to the freezer for a few minutes, taking care that ice crystals don’t form.